Thirty years ago or so role playing games and war games were not yet separate hobbies. It’s well understood that D&D evolved out of miniature war gaming rules like Chainmail (1979). But it’s also interesting to see how the first and second editions of Warhammer (1983 and 1984) straddled these two different categories, with one foot in the world of fantasy armies and the other foot rooted in role playing small encounters with lots of character development and dungeon-crawling. Eventually, these different impulses split Warhammer into two different games: Warhammer 3rd Edition (1987) and Warhammer Fantasy Roleplay (1986). But one of the things that made Warhammer so much fun as a war game was that it retained the flavour of a role playing game long after it was just used for table-top battles. I think that’s a huge part of why Oldhammer is so popular now. A neglected fossil that captures this moment in Warhammer’s early history is the scenario The Web of Eldaw by Rick Priestly (1985). It’s found in a Games Workshop magazine entitled “The Good Games Guide Vol. I”, which is itself a unique historical document. 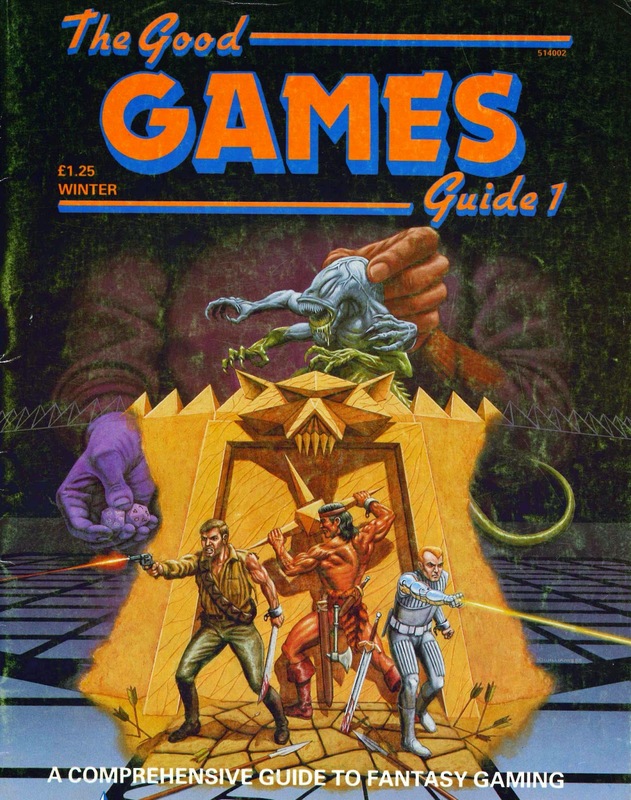 The Good Games Guide attempts to survey the entire field of the hobby as it existed in 1985, listing every AD&D module with helpful commentary, detailing games as diverse as Fighting Fantasy to Advance Squad Leader, and profiling the best games from GW’s competitors, such as Steve Jackson or Avalon Hill. As even the ads in this magazine show, it comes from an age when Games Workshop sold games of all sorts and so promoted the hobby at large. 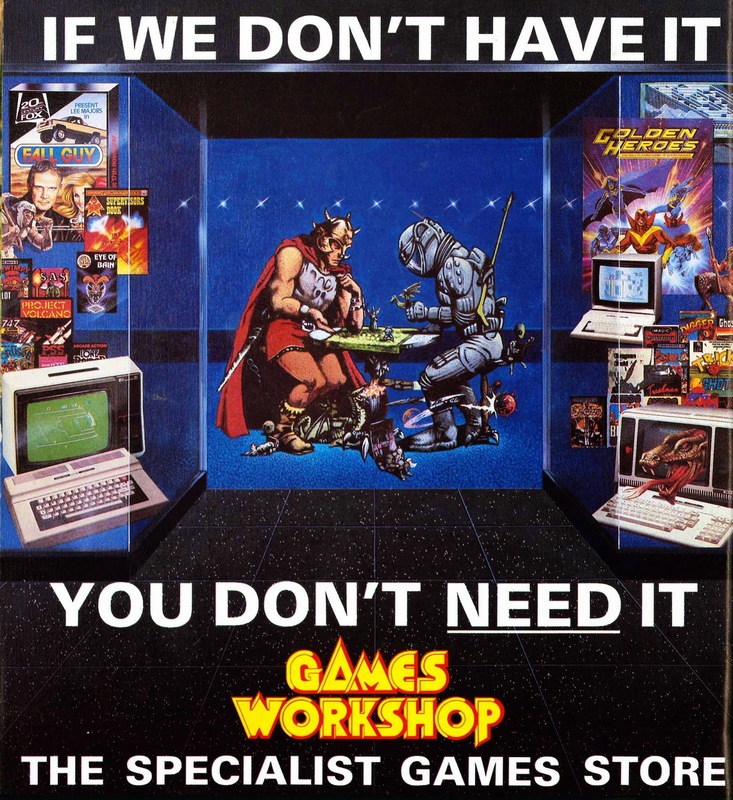 Sadly, this ecumenical approach to gaming was banished from GW just a short time later when it (and White Dwarf) decided to focus exclusively on promoting GW’s own games. And so, we never got a Good Games Guide Volume II. That the Web of Eldaw is a hybrid between a war game scenario and a role playing adventure is apparent from the fact that it’s written with stats for both Warhammer and Warhammer Fantasy Roleplay. In fact, the Web of Eldaw is the first Warhammer Fantasy Roleplay adventure ever published, predating WHFR itself (the rules for which don’t seem to have been finalized by the time of the Web’s publication, since stats in the Web are wonky). The adventure consists of a short dungeon crawl, with the players taking four pre-generated characters and facing off against a referee, who takes the role of the dungeon’s guardians. The Web of Eldaw itself is of middling quality. The text lacks any illustrations, the perils of the dungeon are boilerplate and the climax of the adventure (an army-sized battle royale between the heroes and villains) is skipped over in just a few sentences on the last page. But that being said, there are some priceless touches. My favourites include a guardian demon, who is described as “polite and apologetic but will slay anyone who tries to pass” and the discovery of a very special magic crown. Not only does the crown grant the wearer immortality, but it can only be removed with the wearer’s permission. Unfortunately, its current owner, King Lufric, was decapitated several centuries ago, and his still-living head was stuffed by his usurper into a box, where Lufric was forgotten. By the time the adventurers find this grisly trophy, the King’s head under the Crown “looks more like a brown leather bag, the features... so distorted and putrefied”. It is, however, still alive and drones in an gurgling whisper about better times. Although the Web of Eldaw is a flawed gem, it shows how some of the most exciting parts of Oldhammer gaming come from role playing. Like the Terror of the Lichemaster, it uses very few models, making it into a quick and deadly skirmish where one bad roll can doom you to defeat. Like Blood Bath at Orc’s Drift, it throws several players together on one side, but gives them different motivations, goals and victory conditions. Like the Tragedy of McDeath, it derives its spooky mood by drawing on (and parodying) Shakespeare’s plays. And like all of the early Warhammer scenarios, it requires a referee to guide the characters into a rich adventure. Unlike these scenario packs, however, Citadel didn’t give the Web of Eldaw its own dedicated range of miniatures. As a postscript, I'll say that I believe that war games and role playing games are once again converging, allowing each to benefit from the strengths of the other. Dead Man's Hand is a good example (although one far away from the fantasy genre). This is a skirmish game set in the Old West combining small scale competitive battles with character development and lots of story. Let's hope that games like this become more of a trend! A pdf of the different pages of Web of Eldaw is below... Please let me know if you ever run it as a game. 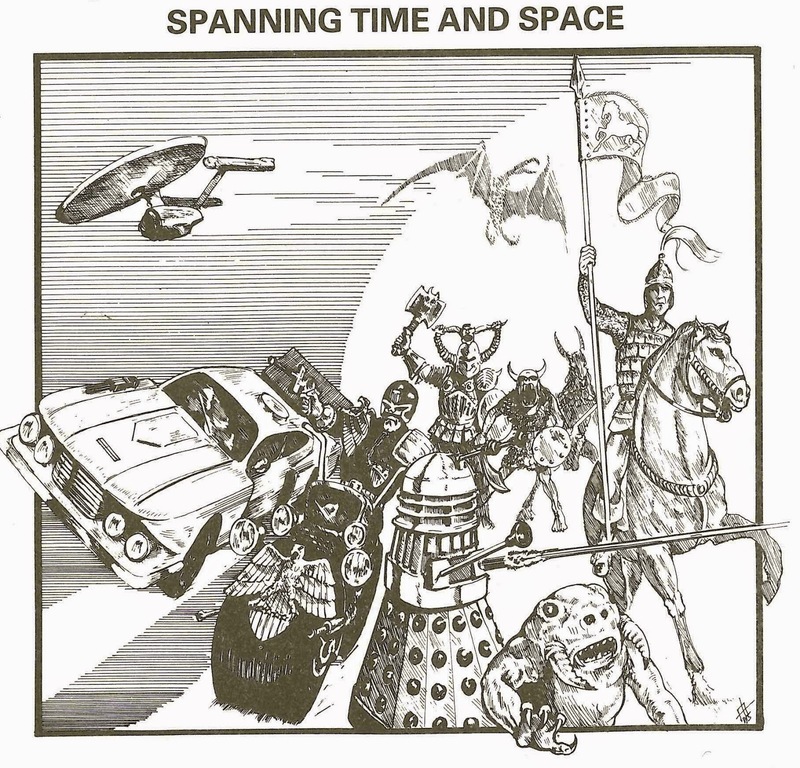 A few years ago I randomly discovered James Maliszewski's Grognardia blog, which helped lead me back into the world of gaming (and forward into blogging). This post reminds me of a Grognardia post, in the best possible way. Informative, filling in pieces of the wargaming/roleplaying history, but with a critical modern eye. I've recently acquired the WFRP 1st edition rulebook and have been looking for a short and simple adventure to have a go of it. This is just what I'm looking for. Thanks! This is great, and I have to say well done....and thanks so much for the pdf. Do you have the whole catalog done by chance? I've got a ton of the old catalogs scanned, but this one I have not been able to get done. Still mad at my mom for throwing this one away years ago. I remember reading Web a couple years back and thinking it could be spruced up into a pretty decent RPG scenario. You're right of course about the re-convergence of RPGs and wargames. Those smaller, story-based skirmishes have been where my main interest in miniatures games has been sitting for a quite a while... first with Confrontation's campaign/story packs and then on to such games as .45 Adventures and Chaos in Carpathia. THW just announced their 2 Hour Dungeon Crawl game... and as REEF has been mentioning on his Youtube channel even modern Warhammer seems to be moving away from 'tournaments' toward more story-based games. To focus in on one detail: Bakshasa, the "polite and apologetic" guardian demon who will "slay anyone who tries to pass," reminds me of Spectator, a fan-favourite Beholder NPC from the CRPG Baldur's Gate II. He likewise is polite and wishes he could just hand over the contents of the chest he is guarding, but barring some clever dialogue he will attack any pilferers. He was popular enough that he came back in the expansion pack Throne of Bhaal. Here's a picture of Spectator that gives a taste of his personality: http://www.sorcerers.net/Games/BG2/Walkthrough2/images/screens/spectatorL.jpg. I wonder now if Bakshasa was the inspiration for this character or if they are both drawing on a deeper trope. Thanks for all the great feedback. The comparison to Grognardia is particularly gratifying because that site is a big influence on me. Kaleb - I don't have a pdf of the entire catalog. My scanning facilities are a lot more primitive than my website might suggest, and I don't think I could do the entire thing justice. However, I'd very much like to preserve a digital copy of this for posterity (we have to think of the children). If you're scanning set-up is better than mine, I'd be happy to lend you the GGG if you'd like to digitize it. And Matthew O. -- great reference! Sometimes I forget how witty Baldur's Gate could really be. Space Hamsters forever!